Though I can’t give a new Mini Doughnut Maker to all of you, I can share this delicious recipe for Baked Apple Cider Doughnuts with Maple Glaze that I found. Bake your own low fat doughnuts and indulge in a decadent treat for less Points than most doughnut recipes. Made with delicious apple cider and pure maple syrup, these tasty doughnuts are made by using a mini Bundt pan, and taste so good, it’s hard to believe they are just 6 Points each. I wish I could get the Points even lower, but these are doughnuts after all, and I didn’t want to sacrifice too much of what we all LOVE when eating doughnuts! Indulge in a big, delicious, guilt-free Apple Cider Doughnut with Maple Glaze. For just 6 Points, these baked doughnuts are made by using a mini Bundt pan, so they are just as pretty as they are tasty. Whisk together flours, baking powder, baking soda, salt and cinnamon in a mixing bowl; set aside. Whisk together egg, brown sugar, apple butter, 1/4 cup maple syrup, cider, yogurt and oil in another bowl. Add dry ingredients and stir just until moistened. Divide half the batter among the prepared molds, spooning about 2 tablespoons of batter into each mold. Bake about 10 to 12 minutes, or until the tops spring back when touched lightly. Loosen edges and turn the cakes out onto a rack to cool. Clean the mini-Bundt pan, then re-coat it with cooking spray and sugar. Repeat with the remaining batter. To make maple glaze: Combine confectioners’ sugar and vanilla in a bowl. Gradually whisk in enough maple syrup to make a coating consistency. Dip the shaped side (underside) of the “doughnuts” in the glaze to coat. Then set them, glazed-side up on a rack over wax paper for a few minutes until the glaze has set. Love this. I was looking for an apple recipe. This will be on my list for breakfast when family comes next week. I may have to try them tomorrow just to test run the recipe. Thanks for all the great recipes. I asked my blog readers if they knew of any good WW blogs and they referred me to you! I’m so glad they did because you blog is fabulous :) I have 2 mini bundt pans and this would be really fun to make with them! What can I do if I don’t have the cute pan? 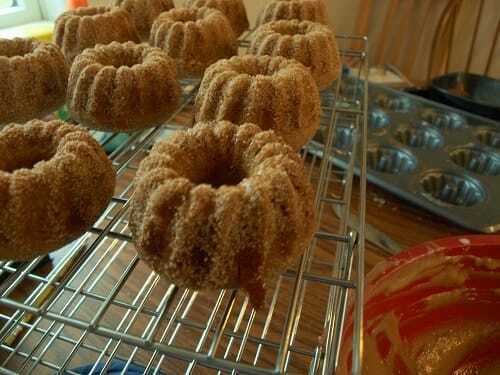 You can use a doughnut pan if you have one, or you can use a muffin pan, but they will be smaller than the mini bundts.